I have a group that has paddled in the Arctic for the past 6 summers, we are looking for something different. 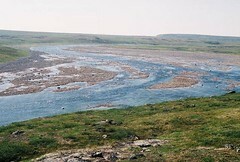 The Rae River near Kugluktuk has come up in discussion- does anyone have any information on this river? I haven't been able to find much information. I have no real information on the Rea River. Thus I can only offer some very general comments that may be self-evident. 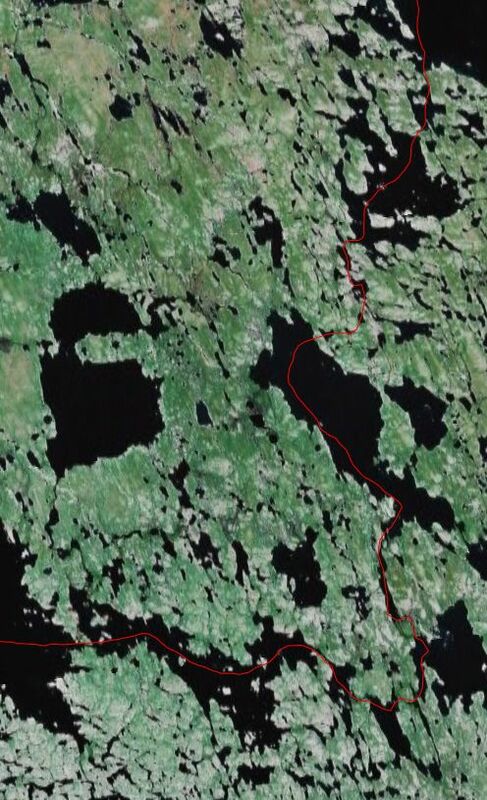 When looking at smallish rivers and the 'canoeability' I first look at the size of the drainage basin feeding that river and in particular whether or not there is a largish lake feeding the 'river' someplace near the start. If there is no largish lake to feed it and a small drainage area, there will probably be very little water flow. But one does not need much water if it is concentrated in a narrow channel. However if it is a wide, bouldery, and shallow channel it becomes a long portage grunt. Have also been looking for information on the Rae with limited success. It certainly shows as something on the topos. Was in Kugluktuk a few weeks ago after doing the Coppermine. The folks I spoke to snowmobile out to the Rae in the winter, but didnt know too much about the summer conditions. Put in may be a bit of an issue as well. Looking at topo maps, the Rae seems a good sized river. I have spoken to a friend who owns a tripping company and he knows of no-one who has explored it. I will continue to study the maps and hopefully find someone who has been on the river. I paddled the Coppermine a couple of years ago. Seeing part of the river and reading about Dr. John Rae's travels in the area has certainly intrigued me. what i would add to the mix are two things. 1. what part of season you start. 2. how much snowfall the area got. three rivers i have done come to mind. the noomut. we walked for 3/4 days until we got enough water. the kaleet. we were in lakes that were just over ankle deep many miles into the river. in other years jim abel et al and another fellow, aki from japan both ran out of water and had to make other plans. think rescue. george luste's comment on the river reminds me of the kuwak. but there we had a big feeder lake, the tulemalu (22miles by 12 miles) and yet minimal water. we were not too far into season but we spent miles scraping bottom. It really does depend... Last summer I paddled the Kunwak without touching bottom. The ice had already left and there was sufficient water levels for enjoyable canoeing and rapid running. For many small rivers, if you start near the headwater be ready to walk and wade lots if it is a dry year, a quick melt, if you depart late, etc. As for the Rae, try to find some pilot who is flying over it to pass you some information about it. truer words were never spoken. indeed i have one very specific example. dan selig and i were running the thlewiaza river when we hit solid ice in upper neultin. we were 'advised' that there was an alternate route via debartok to dalphe lake and a stream running back to the thlewiaza. we did it no problem. i told mike bunn, a fellow canoest about it. on a subsequent year he tried it. he spend about two weeks walking a dry stream bed to get back to the thlewiaza. paddle power, perhaps you might tell the tale of getting to lake tulemalu. my wife and i did it from carruthers lake and upstream to a cross over. a bit of work and not much instruction. we did find stone markers, but it was a guess. obviously, the bottom left was carruthers and the top right was tulemalu. The Rae has recently sparked interest among myself and fellow paddlers. Has anyone learned anything more about water levels? Are you connect with Iva? Will Lange and his party did the Rae in 2011. I met them on the river with my floatplane at a place now called (unofficially) Will's Landing. For anyone planning to paddle the rivers entering the Coronation Gulf this summer, we have had greater snowfall this year than I have seen in the past 46-years, so the rivers should have lots of water. 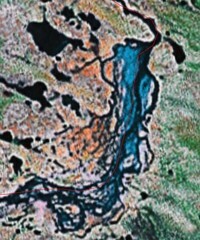 I upstreamed the Rae to the Coppermine River's headwaters circa 1985. It was tough going and only something you'd want to do once and when young. 40+ days of gear, uggh!